Abstract: While not the largest memory supplier, OCZ has definitely been a driving force when it comes to raising memory performance. For the computer geek looking for an adventure, there has never been a better time to be an enthusiast. Just look at all the overclocker friendly gear on the market these days! From exotic cooling devices to flashy lights, LEDs and super-powerful power supplies, if you have the money, it's a dream come true. Memory has traditionally been the weakest point in the overclocking trifecta of Processor/motherboard/memory, simply because most modules cannot run much higher than spec. The traditional overclocker's trick with memory is to simply raise the voltage higher and higher. While most motherboards limit how high users can go to protect them from damaging their components, DFI has been causing a stir in the enthusiast community by removing these limitations. While not the largest memory supplier, OCZ has definitely been a driving force when it comes to raising memory performance. Today PCStats will be testing a set of OCZ's 512MB PC4000 Gold Dual-Channel VX (Voltage eXtreme) DDR memory. With a name like that it had better be prepared to overclock to the roof! The PC4000 Gold Dual-Channel VX is rated to run at 250 MHz with timings of 2-2-2-8 and a maximum voltage of 3.3V. If you do not plan to overclock this memory, the PC4000 Gold Dual Channel VX can also run with 2-3-3-8 timings at 200 MHz with only 2.6V. Heatspreaders have become standard equipment on memory, even if they're mostly redundant for their stated purpose. 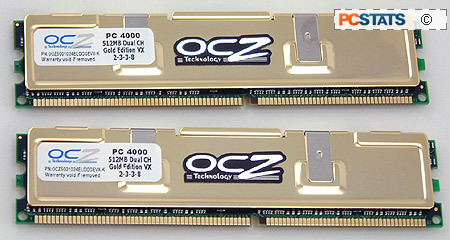 OCZ keeps the PC4000 Gold Dual Channel VX safe with gold plated copper heatspreaders. At PC3200 speeds the heatspreaders are only slightly warm to the touch, but when overclocked at high voltages the heatspreaders are toasty. I recommend that anyone planning on using 3.3V+ with their memory should actively cool the memory modules; a 120mm moderate CFM fan does the trick nicely. On AMD test systems we're only interested in seeing how high we can go with the memory running 1:1, as running with other dividers puts the overclocking bottleneck elsewhere, not with the system memory. The DDR RAM latency must run at 2-2-2-5, or the memory's tightest possible timings, as quick access is more important to the CPU design. Just for arguments sake, we will also be conducting overclocking tests to see how high the memory will go with conservative timings (3-3-3-9) although we will only benchmark the system with the tight memory timings mentioned above. Let's get started!